Too many of the most prominent management gurus today make steel-clad guarantees, based on claims of irrefutable research, promising to reveal the secrets of why one company fails and another succeeds, and how you can become the latter. Combining equal measures of solemn-faced hype and a whole body of delusions, statistical and otherwise, these self-styled experts cloud our ability to think critically about the nature of success in business. Like a virus, these fundamental errors of thinking infect much of what we read, whether in leading business magazines, scholarly journals, or management bestsellers. 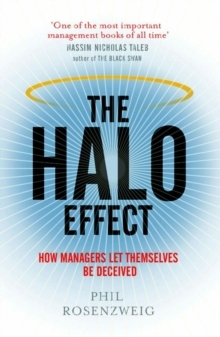 Central among these delusions is the Halo Effect, the tendency on the part of the experts to point to the high financial performance of a successful company and then spread its golden glow to all its attributes: clear strategy, strong values, brilliant leadership, and outstanding execution. But should the same company's sales head south, the very same attributes are turned on their heads and derided for poor decision making across the board - suddenly the strategy was wrong, the culture was complacent, and the leader became arrogant. 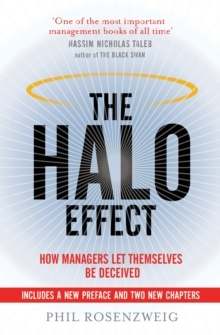 The Halo Effect not only points out these delusions that keep us from understanding business performance, but also suggests a more accurate way to think about leading a company. This approach - focusing on strategic choice and execution, while recognizing the inherent riskiness of both - clarifies the priorities that managers face. 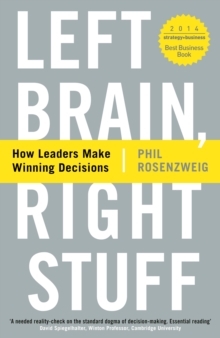 Irreverent and witty, Rosenzweig is uncanny in his ability to puncture the pretentious balloons of some of our most sacred management cows.